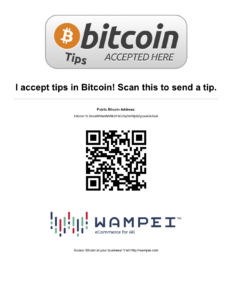 How do I accept Bitcoin Tips with a TipKit©? Once you receive your TipKit©, the public page will look something like the image below. You can post the sign where you work, display the QR code on your clothing, post it on your Instagram or website, basically post it anywhere your customers may exist! What do I do with Tips I receive? You have options to cash out of your Tipkit©. It acts as a paper wallet, so this advice applies to any paper wallet. Bring the secret page (The QR code of the secret key) to a Bitcoin ATM that buys Bitcoin. (Vault Logic has many ATMs that do this). You scan the secret key, and voila, it will give you cash! Sweep the funds into a mobile wallet like BRD or Copay (links to video walkthroughs on sweeping into the wallets.) You can then spend the Bitcoin directly, move it to an exchange, sell it to someone in person a crypto meetup or via a P2P service like localbitcoins.